When it comes to architectural structures, three words are of immense importance: location, location, location. And today’s homify 360° discovery not only flaunts a decadently designed facade and fabulous interiors, but also a scenic view to rival just about any others. 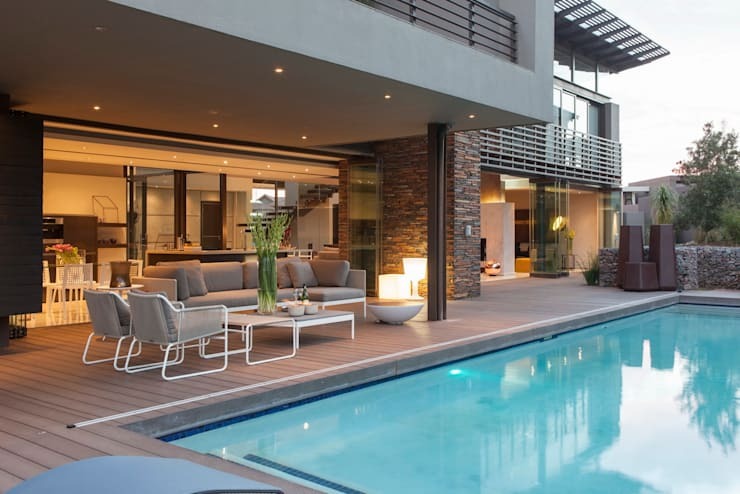 Noteworthy architectural firm Nico van der Meulen Architects, who is well known on the South African front for their pristine architectural designs, treats us to one of their very bests in one of the very best locations: Meyersdal Eco Estate right outside Johannesburg. 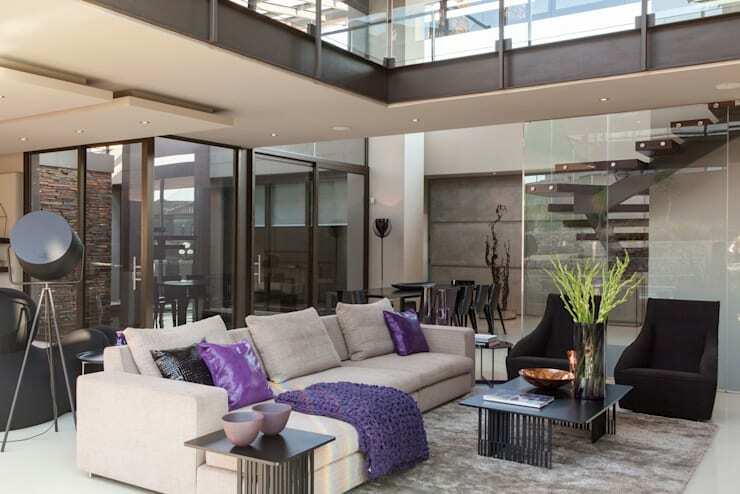 This 674 square-metre creation boasts a lush environmental bushveld as its surroundings. So, without any further ado, let’s get right down to discovering this glamorous house set in paradise. A requirement from the clients was that their house be a spacious and modern creation that expresses its appreciation for outdoor living. And since this residence is located in a private eco estate, that box was quickly and cleverly ticked off our architects’ list. 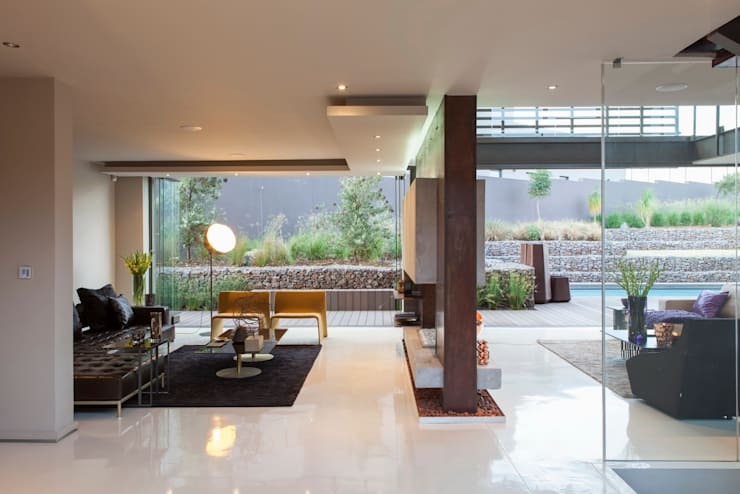 Adding an abundance of open-plan glass to the steel house, Van der Meulen constructed their design so that the interior spaces open up on the surrounding garden/landscape, encouraging scenic views and interaction with nature. 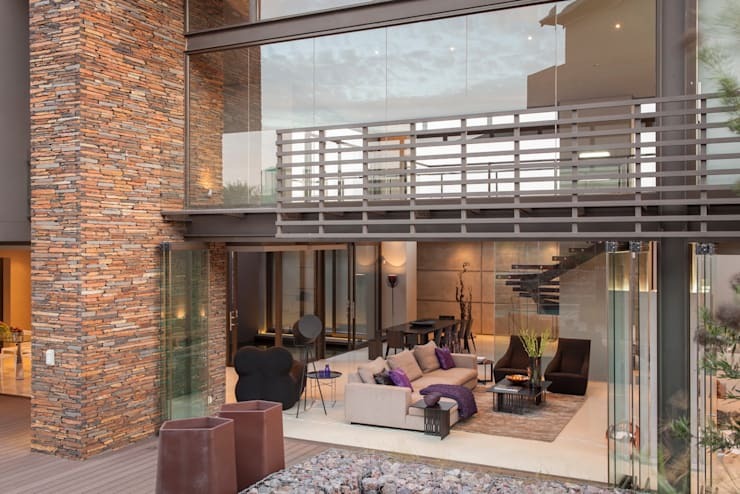 Gabions and natural rocks were used for the house’s terraces, ensuring a pristine view of the outstretched savannah where game roams freely. Upon closer inspection, we see the exquisite collection of materials that make up the facade. Concrete, stone, steel, glass, and wood all adorn their relevant surfaces equally impressively, making for a fascinating setting that unquestionably rivals the majority of modern houses. Here we get to see the stunning outdoor seating area on the wooden deck, making for a prime relaxation spot that most definitely gets appreciated quite often. An interesting contrast is created by combining the transparency and openness of glass with the solid stone walls, not only texture-wise, but also in terms of colour. Notice that floating staircase that takes up as little legroom as possible, lending an airy feel to the interior spaces. Of course it’s not only the house that flaunts an expertly designed look; the accompanying furniture and décor pieces are also top quality. Glamorous textures and layouts bring forth a remarkable colour palette of earthy neutrals, ranging from creamy browns to dark greys. 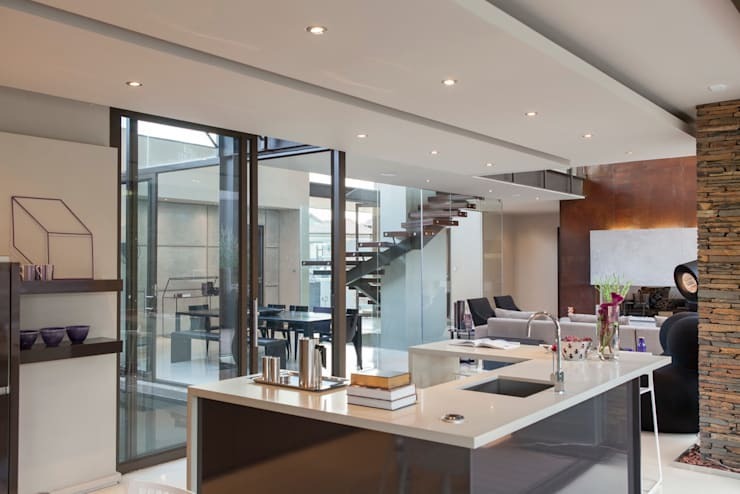 In addition to the floating staircase, various elements take on the concept of floating touches, and can be seen from every perspective and vantage point throughout the house. Like the entire house, the kitchen also boasts a light, open, free-flowing vibe, allowing that busy cook full access to the guests who are busy mingling in the open-plan living room. A fantastic U-shaped island functions as a beautiful prepping spot for a range of dishes, as well as a breakfast nook for the family’s more informal dining occasions. Want to see more of our superb kitchen islands? Then take a look at: Kitchen islands to treasure. If you have the space, then why not use it? This house boasts not one, but two living room areas, separately stylishly by an open fireplace accessible from both sides. Although neutral tones take centre stage in both living rooms, it is evident that the one (seen on the left) flaunts a look that is decidedly a touch darker and bolder than the other. Upstairs is where we locate the master bedroom, also basking in a majestic dose of natural light streaming indoors. Hardwood floors mix with plush rug surfaces, providing the best of both worlds in terms of underfoot styles. 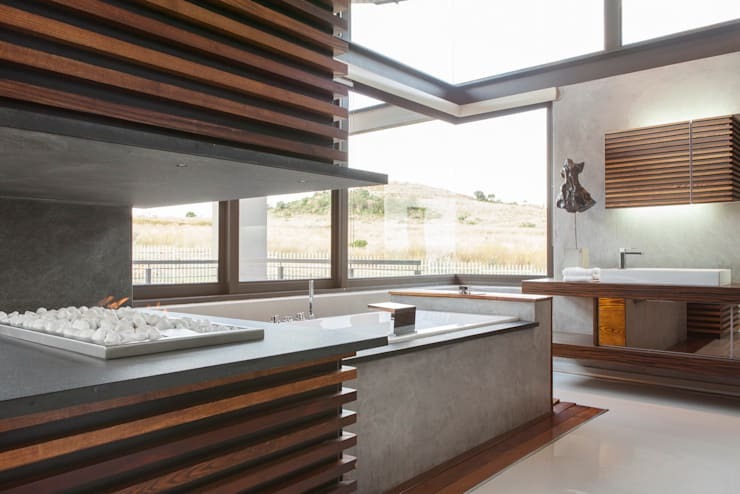 The linear design that is so characteristic of the modern style shows us its best look in the bathroom with (predominantly) horizontal timber panels and vertical lines conjuring up an ultra sophisticated spot. And how many bathrooms can boast about having their own fireplace? This hot beauty will undoubtedly put a fabulous spin on those chilly winter evenings, turning a relaxing bath time into a cosy and tranquil spa-like experience. 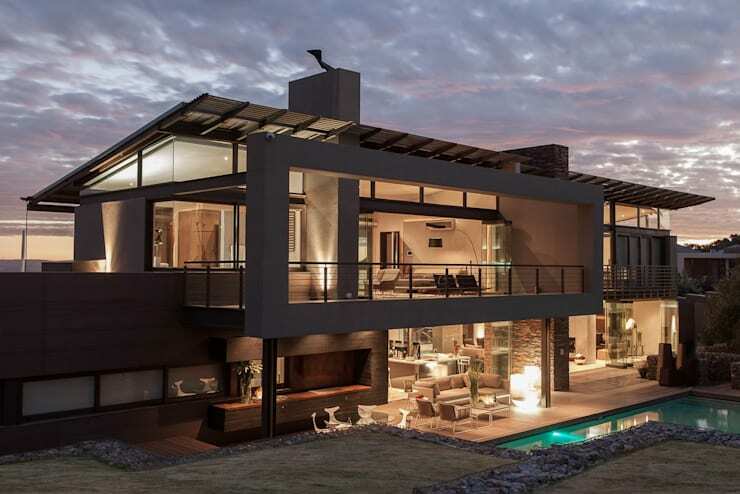 We love hearing from you, so type up your comments below and share with us your opinion on this fabulous house.